Mice are gentle pets that are very smart for their size. They are very quiet, don't cost much to feed, and are fun to observe. Perhaps surprisingly, mice are also well-loved animals that have become the focus of stories, fables, and cartoons as well as the bold heroes of full-length novels. As a result, you have a huge range of name options for your fuzzy little pets! Walt Disney seems to have had a passion for cartoon mice. They are everywhere, in theme parks, movies, and cartoons. There are sidekick mice (including a whole entourage of Cinderella's little helpers) as well as full-scale movie stars. 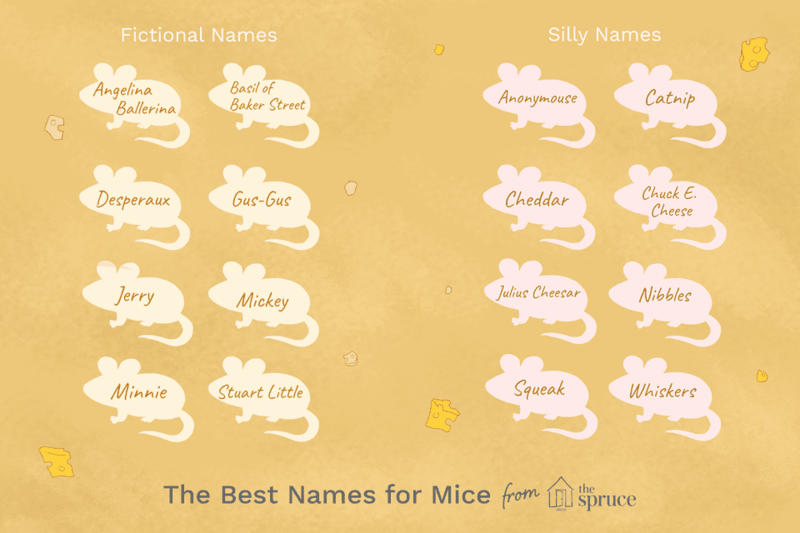 If you love Disney and mice, you have a wide range of naming options! Mickey: The corporate symbol for the Disney Corporation, Mickey (and his ears) are known around the world. Minnie: Mickey's girlfriend has her own following (and fashion statement). Steamboat Willie: Walt Disney's very first cartoon mouse, he started an empire. Gus-Gus: from the movie Cinderella. Who knew that mice made such impressive literary characters? Here are just a few of the most famous literary mice. Many of these are also movie stars! In addition to all the mice listed above, you may wish to consider one (or more!) of these namesakes! Mice are social animals and enjoy living in groups. If you can, adopt more than one. Then, consider naming them based on a single source. For example, choose from among the many mousey names in movies like The Rescuers, The Great Mouse Detective, or the Disney universe! Before adopting, be sure to research mouse care. Select the appropriate cage, accessories, foods, and water bottles. Learn a little about mouse behavior and health. And, of course, be sure you know whether your mice are males or females. If you have one of each, you'll need to read up on mouse reproduction.